The UFC 236 media day faceoffs are in the books. Earlier today (April 11), the UFC held a media day session in Atlanta. Fighters on the main card spoke to reporters about their upcoming bouts this Saturday night. UFC featherweight champion Max Holloway and Dustin Poirer were in attendance. 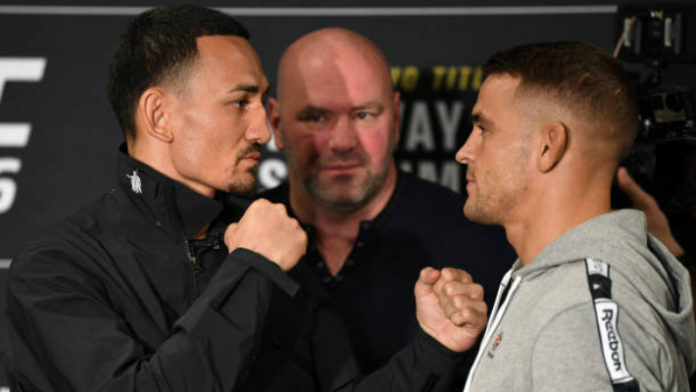 They will headline UFC 236 for the interim UFC lightweight title. Co-headliners Kelvin Gastelum and Israel Adesanya were also in attendance. Like the main event fighters, Gastelum and Adesanya spoke to media members and had a staredown for the cameras. Other fighters such as Eryk Anders and Khalil Rountree Jr. also got the staredown treatment. UFC 236 will be held inside the State Farm Arena in Atlanta, Georgia on April 13. The main card is set to air live on pay-per-view exclusively through ESPN+ at 10 p.m. ET. The UFC Fight Pass prelims will begin at 6:15 p.m. ET. The action will transition to the major ESPN network at 8 p.m. ET before the main card gets underway. MMA News will provide live coverage of UFC 236. Be sure to join us for live weigh-in results and main card predictions tomorrow. When fight night arrives, we’ll be bringing you live results, highlights, and post-fight tidbits.